When our ba=nas produce fruit, they really go to town. And why is it that all the trees have bunches concurrentlyWhen they are fruiting, we end up having hundreds of kilos of bananas at once and its just too much to cope with eating them all fresh. We’ve been through mousse, smoothies, ice cream, cakes, bread, biscuits, chutney and lots more, but still too many. re bananas from your tree than you can possibly eat and have them ripen all at once! This all has the flow on effect that we now dont buy many bananas during the rest of the year as we have to ‘save’ ourselves for our own bananas. 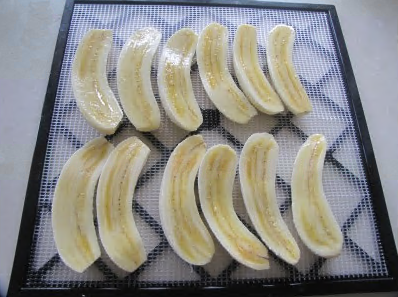 Oh, plus we have lots of bananas in the freezer, skinned and brioken into small pieces and ready to use,. But the most popular way of preserving our harvest is by dehydrating them. The lightweight bananas make great hiking snacks, and are easy to carry anywhere really. 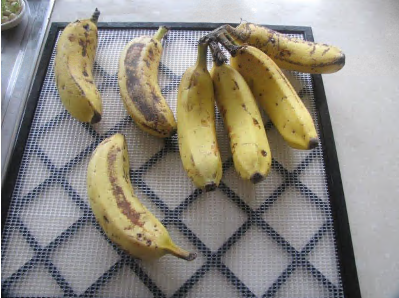 I’ve been asked lots to explain how I do it, so here are the simpe instructions on how to dehydrate your bananas. They keep 12 months in an airtight jar or ziplock bag too. 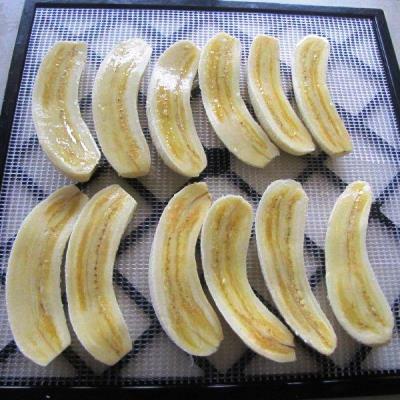 First, skin the bananas and cut in half lengthways. I dont need to dip them in lemon juice as our Goldfinger bananas dont go brown. If you use other varieties, you’ll need to dip or paint them with lemon juice before drying. I’m not too fussy about what the skins look like. As long as the banana is firm, it will be good to dehydrate. Then.. Lay on dehydrator tray. I have a 9 tray excalibur. Dehydrate @ 135degrees F/about 57C for about 16 hours, turning once. Remove from the dehydrator and package. They keep ages in airtight jars or bags.